Subject: Type XXI U-boat U2540. 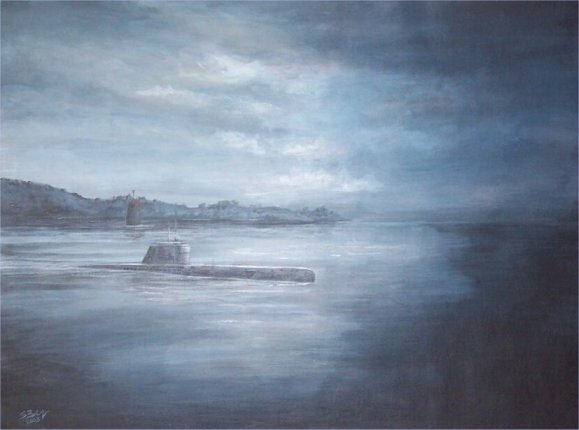 Approx size 15.5" x 11.5"
Based upon photos taken by the artist in 2003 of the Type XXI U-boat Wilhelm Bauer that is currently a museum boat in Bremerhaven, Germany. The type XXIs were true submarines, designed for life beneath the water, as opposed their predecessors which were really submersibles. This new technology was intended to change the course of WW2 but it was introduced too late with only 2 boats actually conducting a war patrol out of the 120 Type XXI U-boats eventually constructed.